The hepatitis C virus (HCV) is both hepatotropic and lymphotropic, responsible for a great number of hepatic and extrahepatic immune-system disorders that comprise the so-called HCV syndrome. 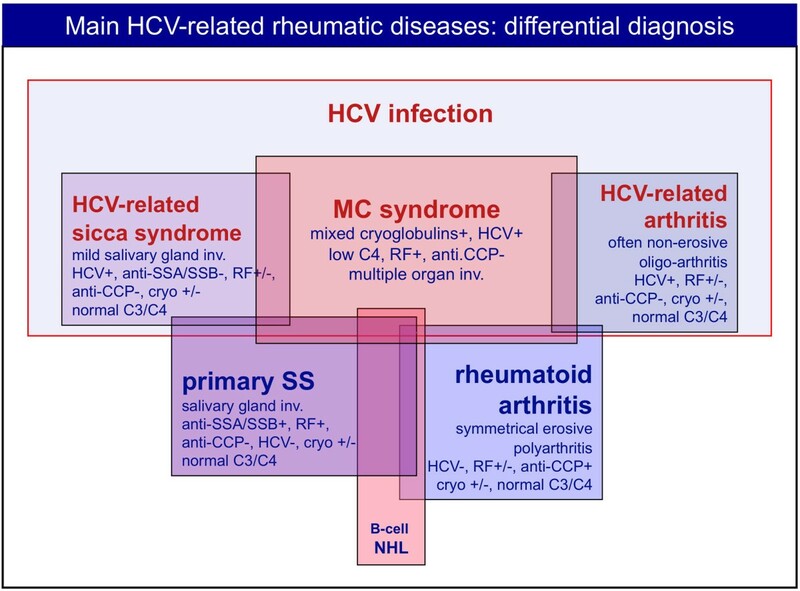 HCV-associated rheumatic diseases are characterized by frequent clinico-serological overlap; therefore, correct classification of individual patients is necessary before therapeutic decisions are made. This is particularly difficult to do, however, because of the coexistence of viral infection and complex autoimmune alterations. In this context, mixed cryoglobulinemia syndrome (MCs) represents the prototype of virus-related autoimmune-lymphoproliferative diseases. MCs can be treated at different levels by means of etiological treatment with antivirals (peg-interferon-alpha plus ribavirin) aimed at HCV eradication and/or pathogenetic/symptomatic treatments directed to both immune-system alterations and the vasculitic process (rituximab, cyclophosphamide, steroids, plasmapheresis, and so on). In clinical practice, the therapeutic strategy should be modulated according to severity/activity of the MCs and possibly tailored to each individual patient's conditions. Cryoglobulinemic skin ulcers may represent a therapeutic challenge, which should be managed by means of both local and systemic treatments. HCV-associated arthritis should be differentiated from the simple comorbidity of HCV infection and classical rheumatoid arthritis. It may be treated with low doses of steroids and/or hydroxychloroquine; the use of biologics (rituximab) may be considered in more severe cases. Primary Sjögren's syndrome is rarely associated with HCV infection, while sicca syndrome and myalgia are frequently detectable in hepatitis C patients, with or without cryoglobulinemic vasculitis. Other autoimmune rheumatic disorders (poly/dermatomyositis, polyarteritis nodosa, osteosclerosis, fibromyalgia, and so on) have been reported as potentially associated with HCV infection in patient populations from different countries, suggesting the role of genetic and/or environmental co-factors. The therapeutic approach to these disorders should be decided according to each individual patient's evaluation, including hepatic, virological, and immunological findings. Following the discovery of hepatitis C virus (HCV) in 1989 as the major etiological agent of non-A-non-B chronic hepatitis , some epidemiological studies suggested its possible role in the pathogenesis of mixed cryoglobulinemia syndrome (MCs), which now represents the prototype of HCV-associated autoimmune-lymphoproliferative disorders [1–4]. Since the disease may mimic numerous immunological and neoplastic disorders, the discovery of its association with HCV infection prompted further clinical investigations into the possible pathogenetic role of HCV in other auto-immune diseases [2, 3]. In 2007, we proposed the term 'HCV syndrome', which encompasses the wide spectrum of both hepatic and extrahepatic HCV-associated autoimmune diseases, including some malignancies . Figure 1 shows the variable strength of association between HCV and different diseases in the context of HCV syndrome. Strength of association between hepatitis C virus and different diseases in the context of hepatitis C virus syndrome. The spectrum of different hepatitis C virus (HCV)-associated immunological and neoplastic disorders may be classified on the basis of clinico-epidemiological, histopathological, and molecular biology studies in three different levels. High: the association with HCV infection characterizes the large majority of patients; HCV infection is one of the major triggering agents of the disease. Medium: patients with the disease show a significantly higher prevalence of HCV infection compared to controls; the putative pathogenetic role of HCV is also supported by pathogenetic studies and it may identify at least a specific disease subset. Low: the possible association is suggested by limited clinico-epidemiological observations; a pathogenetic link in at least a specific disease subset from some geographical areas is probable, but needs to be definitely demonstrated. Other possible associations have been suggested (see text) on the basis of anecdotal observations. B-cell NHL, B-cell non-Hodgkin's lymphoma; HCC, hepatocellular carcinoma. The pathogenesis of various HCV-associated disorders is quite complex and still not completely understood. HCV infection is the underlying condition that generally precedes by a long time interval the clinical appearance of extrahepatic diseases. The development of different clinical phenotypes is probably the consequence of multifactorial and multistep processes together with decisive contributions by both genetic and environmental co-factors [1–4]. This hypothesis is in keeping with the strong geographical heterogeneity in the prevalence of different HCV-associated diseases [1, 3]. HCV lymphotropism  is responsible for the B-lymphocyte expansion responsible for the production of large amounts of circulating immune complexes, mainly mixed cryoglobulins with rheumatoid factor activity, as well as various organ- and non-organ-specific autoantibodies . Interestingly, the same immunological alterations may also be observed in a significant percentage of individuals with isolated HCV infection [1, 6]. HCV is a positive, single-stranded RNA virus without a DNA intermediate in its replicative cycle, so that viral genomic sequences cannot be integrated into the host genome. Much evidence indicates that HCV infection results in chronic stimulation of the immune system, which facilitates the clonal B-lymphocyte expansion [1, 2, 7]. Figure 2 (left side) summarizes both virus- and host-related co-factors, together with the main biological alterations, of the pathogenetic cascade. The result may be classical MCs or other autoimmune disorders, as well as some malignancies, mainly B-cell non-Hodgkin's lymphoma (B-NHL) . Besides MCs, other rheumatic diseases can be related to this virus with variable strength of association [1, 3, 8, 9]. The present review focuses on the clinical-serological assessment and therapeutic approach to the main HCV-associated rheumatic disorders. The treatment of mixed cryoglobulinemic syndrome must be decided on the basis of the etiopathogenetic cascade that leads from hepatitis C virus infection to multiple immune-system alterations, mainly B-cell proliferation, and lastly to immune complex-mediated small vessel vasculitis. The vasculitic syndrome may be complicated by malignancies, mainly B-cell lymphoma. Accordingly, we can treat mixed cryoglobulinemic syndrome (MCs) at three different levels by means of etiological, pathogenetic, and symptomatic therapies. The use of antivirals, namely peg-interferon-alpha (peg-IFNα) plus ribavirin (RIBA), aims to eradicate the hepatitis C virus (HCV); it represents the etiological treatment of HCV-associated MCs. The anti-CD20 monoclonal antibody rituximab is considered the most useful and safe pathogenetic treatment of MCs. In selected patients with severe, active clinical manifestations, sequential or combined therapy with antivirals and rituximab has been usefully employed (see also Figure 3). CIC, circulating immune complexes; CPX, cyclophosphamide; HLA, human leukocyte antigen; LAC, low antigen-content; LDL, low-density lipoprotein; RF, rheumatoid factor. The pathological hallmark of MCs is the leukocytoclastic vasculitis of small arteries, capillaries, and venules; therefore, the disease is currently classified among systemic vasculitides, in the setting of small-vessel vasculitides, and the terms MCs and cryoglobulinemic vasculitis should thus be related to the same clinico-pathological condition . MCs represents the cross-road between classical rheumatic diseases, such as rheumatoid arthritis (RA) and primary Sjögren's syndrome (pSS), and other autoimmune lymphoproliferative disorders  (Figure 1). It is characterized by the typical clinical triad of purpura, weakness, and arthralgias and by multisystem organ involvement [1, 2]. The typical cutaneous and visceral organ involvements, such as purpura, skin ulcers, and glomerulonephritis, are the consequence of the vessel deposition of circulating immune complexes, mainly mixed cryoglobulins and complement . Liver involvement, generally a mild to moderate chronic hepatitis, may evolve to frank cirrhosis in a minority of patients, and is rarely complicated by hepatocellular carcinoma . Renal involvement is often responsible for membranoproliferative glomerulonephritis type I; it may severely affect the overall prognosis of patients with MCs, often in combination with liver damage . Peripheral neuropathy and skin ulcers are quite frequent manifestations of MCs; they are barely responsive to treatments and consequently may compromise the patient's quality of life . Finally, B-NHL and widespread vasculitis may complicate a minority of cases; they represent the most harmful manifestations of the disease [1, 2, 4]. Besides mixed cryoglobulins in serum, marked reduction of hemolytic complement activity, with the typical pattern of low, often undetectable complement C4, is another hallmark of the disease and is particularly useful for disease classification [1, 10, 11]. However, both complement levels and cryocrit rarely correlate with the activity/severity of MCs; consequently, they are not very useful for clinical monitoring of patients and therapeutic decision-making. In contrast, the correct evaluation of B-cell expansion, which represents the biological substrate of MCs, is mandatory because of the possible complication of overt lymphoma [1, 2, 7]. This latter event should be suspected in the presence of rapid increases of cryocrit and serum levels of monoclonal rheumatoid factor and/or complement C4 . The treatment of HCV-associated MCs is particularly challenging due to the complex etiopathogenesis and clinical polymorphism of the disease. 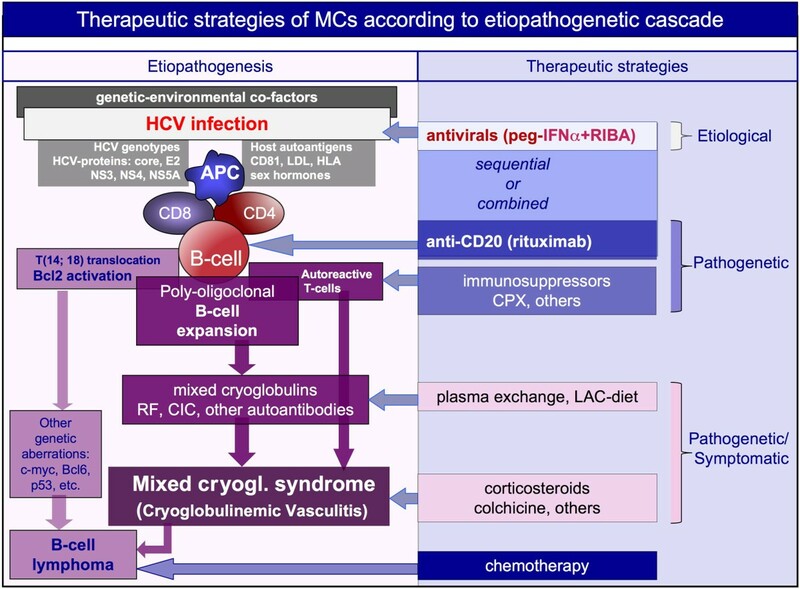 In fact, we can treat MCs at three different levels (Figure 2): the chronic HCV infection; the immune-pathological alterations, mainly B-lymphocyte proliferation; and the immune complex-mediated cryoglobulinemic vasculitis [1, 3]. Moreover, the correct evaluation of different clinical phenotypes, varying from mild purpuric lesions, arthralgias, and/or weakness to severe organ involvement (renal, liver, diffuse vasculitis) or malignancies (B-NHL), should direct our therapeutic interventions (Figure 3). The therapeutic strategy for mixed cryoglobulinemic syndrome may be modulated according to the clinical status of individual patients. We can consider at least four clinical conditions. Mixed cryoglobulinemic syndrome (MCs) may be completely asymptomatic or it may sporadically show very mild manifestations, such as fleeting purpuric lesions on the legs; in these cases monitoring may be sufficient, while an attempt at HCV eradication may be considered. On the opposite side are patients with severe, rapidly progressive cryoglobulinemic vasculitis that must be treated with aggressive combined treatment similar to that used for other systemic vasculitides. Sequential or combined treatment with antivirals and rituximab may be usefully employed in selected patients with severe manifestations. The order of sequential treatment may be decided on the basis of prevalent organ manifestation(s), even if the combined therapy seems to be comparable for efficacy and safety. CPX, cyclophosphamide; CS, corticosteroid; LAC, low antigen-content; peg-IFN, peg-interferon; RIBA, ribavirin; RTX, rituximab. HCV infection results in chronic stimulation of the immune-system , and it may also be responsible for either liver damage or neoplastic complications; in theory, HCV eradication using alpha-interferon and ribavirin should be attempted in all cases [1, 3, 12, 13]. However, a beneficial effect of antivirals may be recorded in less than half of treated patients and they are often associated with important immune-mediated side effects, such as peripheral sensory-motor neuropathy, thyroiditis, and rheumatoid-like polyarthritis [1, 3, 14]. It is plausible that alpha-interferon, which is both an antiviral and immunomodulating agent, can foster or exacerbate these symptoms, possibly in predisposed subjects. In the near future, a vaccine-based therapy  might be able to prevent the progression of HCV infection and possibly to interrupt the self-perpetuating autoimmune mechanism underlying MCs. Preliminary studies suggested that some immunomodulating therapies in association with antiviral treatment, namely cyclosporine A or TNF inhibitors, have synergistic effects in the setting of chronic hepatitis type C [16, 17]. Besides etiological treatments, immunomodulating/immuno suppressive drugs represent the most useful therapies able to affect the main pathogenetic mechanisms of MCs, including T- and B-cell proliferation and autoantibody production. These treatments include cyclophosphamide and an anti-CD20 monoclonal antibody (rituximab) [1, 3]. During the past decade, rituximab has been increasingly employed for both cutaneous and visceral organ involvement of MCs; it can be regarded as a useful and safe pathogenetic treatment of cryoglobulinemic vasculitis . Its safety was also confirmed in patients with liver damage; interestingly, in patients with HCV-associated MCs and advanced cirrhosis, treatment with rituximab was able to improve both the cryoglobulinemic vasculitis and liver function . A comprehensive analysis of the literature regarding the use of rituximab and its role in the therapeutic strategy of MCs patients has been recently published . Very recently, the results of a randomized controlled trial demonstrated that anti-CD20 monotherapy also represents a useful and safe option for patients with severe MCs . Among symptomatic/pathogenetic treatments, a low antigen-content diet can improve the clearance of circulating immune complexes by restoring the activity of the reticulo-endothelial system, which becomes overloaded by large amounts of circulating cryoglobulins . This reduction in the alimentary input of macromolecules with potential antigenic activity may improve the function of the mononuclear phagocytic system, which is normally impaired in MCs . A low antigen-content diet can be usefully employed in patients with clinically mild MCs symptoms (arthralgias, weakness, sporadic purpura, and/or mild sensory peripheral neuropathy), often in association with low doses of steroids (6-methylprednisolone 2 to 4 mg/day) and/or colchicine. Most patients show only mild symptoms for a long time period, and are particularly sensitive to symptomatic treatments and to small doses of daily steroid (1 to 2 mg). Clinically asymptomatic patients do not usually need any treatment, even in the presence of high levels of cryocrit, but patients with severe vasculitic manifestations must be promptly treated with high doses of steroids and/or plasma exchange and/or immunosuppressors; this combination therapy is often able to improve the most harmful disease complications (Figure 3) [1, 4, 22]. The treatment of cryoglobulinemic skin ulcers is particularly challenging. These lesions are prevalent in the lower limbs, where other pathogenetic co-factors may be associated - namely, venous insufficiency and/or arteriosclerotic alterations, which are not rare in older patients with comorbidities and/or who have received long-term steroid treatment. The skin ulcers are painful, non-healing, and often complicated by local infection and they may severely affect patients' quality of life . Figure 4 summarizes the therapeutic strategy for treating cryoglobulinemic skin ulcers, including both systemic and local treatments at a wound care clinic . The long-term administration of analgesics is often necessary to improve the patient's chronic pain and their compliance with local wound care. A team of operators with specific experience should carry out this integrated therapeutic approach [18, 23, 24]. Therapeutic strategy for treating cryoglobulinemic cutaneous ulcers should be based on both systemic and local treatments. After clinical work-up considering the entire MCs, including possible comorbidities (venous insufficiency and/or arteriosclerotic alterations, diabetes, and so on), and careful examination of the ulcer characteristics, the systemic treatment may be based on etiological, pathogenetic, and/ or symptomatic therapies. More aggressive combined treatments (immunosuppressors, steroids, and plasmapheresis) may be necessary in the presence of very severe, non-healing skin ulcers. Long-term administration of analgesics is often necessary to improve the patient's chronic pain and compliance with local treatment, which should be carried out at a wound care clinic. Wound bed preparation, with particular regard to the prevention and treatment of infections, is crucial for the healing of cryoglobulinemic skin ulcers. CPX, cyclophosphamide; peg-IFN, peg-interferon; RIBA, ribavirin; RTX, rituximab. More recently, some studies have suggested that sequential or combined antiviral and immunosuppressive therapy could represent a rather useful therapeutic strategy for treating MCs [18, 25, 26]. This more aggressive treatment could be particularly indicated in patients with major clinical manifestations and/or inadequate remission after standard treatments. On the whole, careful monitoring of a patient's clinical status is mandatory in clinical practice, with particular attention paid to neoplastic complications; in all instances the treatment should be tailored to the individual patient according to the severity of their MCs symptoms (Figure 3) . Given the rarity of the disease and the difficulties of recruiting clinically homogeneous series of patients, there are few controlled randomized trials evaluating the usefulness of proposed treatments for MCs. The results of a consensus conference based on the available published studies and expert opinions have been summarized in a preliminary core set of therapeutic recommendations . A possible pathogenetic role of HCV in pSS has been reported in anecdotal clinical observations . In contrast, the frequent association between sicca syndrome and HCV infection has been demonstrated by both experimental and epidemiological studies focusing on the presence of chronic lymphocytic sialadenitis in patients with HCV infection . HCV can replicate within epithelial cells of the salivary gland of patients with sicca syndrome and HCV infection . In clinical practice, the correct differential diagnosis between some HCV-associated rheumatic disorders and classical rheumatic diseases is still under debate, in particular between MCs and pSS; this probably reflects the lack of standard classification of these diseases in different referral centers. Figure 5 shows the main clinico-pathological and immunological differences between MCs and other possible HCV-associated diseases. Patients with MCs may develop a mild sicca syndrome in the absence of typical histopathological and/or serological alterations . On the other hand, the detection of mixed cryoglobulins in the serum of a minority of pSS cases seems to identify a particular clinical subset characterized by worse prognosis and frequent evolution to malignant B-NHL . In individual cases the differential diagnosis between pSS and MCs may be very difficult, mainly in patients with overt sicca syndrome, cryoglobulinemia, and HCV infection . Therefore, it is correct to classify these patients as overlapping MCs/pSS , and the therapeutic approach should consequently be decided after careful evaluation of the main clinical manifestation(s), including the presence/severity of type C hepatitis. Differential diagnosis between some important hepatitis C virus-associated rheumatic manifestations and classical diseases such as primary Sjögren's syndrome and rheumatoid arthritis is possible on the basis of clinico-serological and pathological features. Some important findings may be usefully employed for a correct diagnosis: the histopathological characteristics and severity of salivary gland involvement and specific autoantibodies (anti-SSA/SSB) are rarely found in hepatitis C virus (HCV)-associated sicca syndrome or mixed cryoglobulinemia syndrome (MCs) patients. Conversely, cutaneous leukocytoclastic vasculitis, visceral organ involvement (hepatitis, membranoproliferative- glomerulonephritis), abnormally low complement C4, and HCV infection, typically found in MCs, are very uncommon in primary Sjögren's syndrome (pSS). Both MCs and pSS may be complicated by B-cell non-Hodgkin's lymphoma (B-cell NHL), and less frequently also rheumatoid arthritis patients. Finally, erosive symmetrical polyarthritis and serum anti-cyclic citrullinated peptide (anti-CCP) antibodies are specific diagnostic findings of classical rheumatoid arthritis, but generally absent in HCV-associated arthritis. However, there is a gray area of clinical overlap between different disorders. RF, rheumatoid factor. Antiviral treatment with IFNα and ribavirin seems to improve sicca syndrome in HCV-positive patients, even if serious immune-mediated adverse events have been observed . Besides topical treatments that may partially improve patients' quality of life, there is no specific systemic treatment for HCV-associated sicca syndrome. As for classical MCs or pSS, the possible complication with malignant lymphomas must also be taken into account in these patients [28, 31]. While arthralgias are one of the most common extrahepatic manifestations of HCV infection, chronic arthritis is significantly less common [4, 8, 9]. When present, it is often a less aggressive oligo-polyarthritis compared to classical RA. 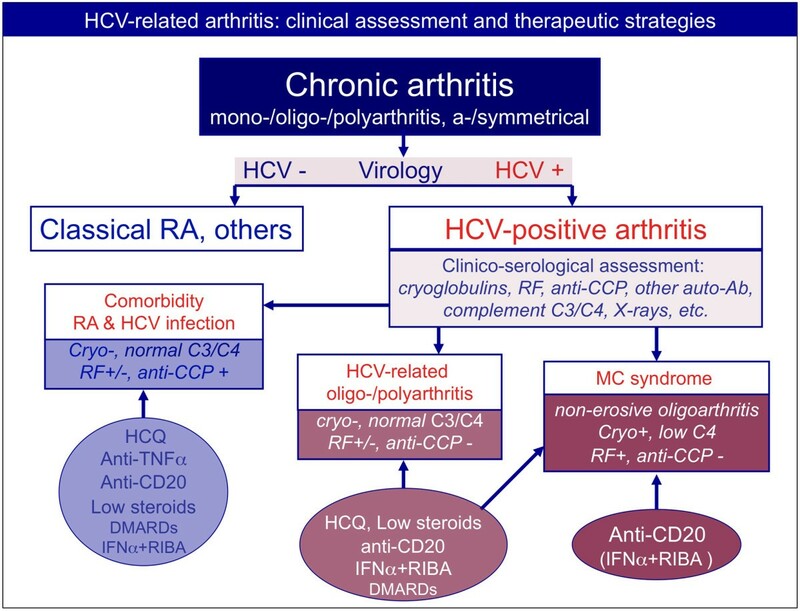 Patients with HCV-associated MCs present with arthralgias, while inflammatory joint involvement is quite rare and generally characterized by mild oligoarthritis . A symmetrical rheumatoid-like polyarthritis may complicate IFN treatment in HCV-positive patients . Because of the relatively high prevalence of the two diseases, it is not rare to observe a simple association between classical RA and HCV infection. Figure 5 summarizes the main clinico-serological parameters for differential diagnosis between classical RA and other HCV-associated disorders [1, 3, 4, 8, 28, 31, 33, 34]. In patients presenting with chronic arthritis, the presence of hepatotropic virus infection (that is, HCV and hepatitis B virus) must be ruled out because of the possible severe, often life-threatening side effects of disease-modifying antirheumatic drugs (DMARDs) and biologics . Several different viral infections may trigger symmetrical arthritis mimicking classical RA and clinical work-up including virological investigations should therefore be done at the patient's first assessment (Figure 6). Differential diagnosis among patients with arthritis and concomitant hepatitis C virus infection, and therapeutic strategies. Clinico-serological and virological work-up is mandatory in patients presenting with chronic arthritis. Patients with polyarthritis and hepatitis C virus (HCV) infection can be classified as either having simple comorbidity, that is, HCV infection and rheumatoid arthritis (RA) or other forms of chronic arthritis, or having HCV-associated arthritis. This latter may represent one extrahepatic manifestation of HCV infection or it can be a symptom of MCs. The comorbidity may be treated with the standard therapeutic strategies for RA, with some precautions because of concomitant viral infection, in particular for methotrexate and leflunomide. On the contrary, biologics (anti-TNFα and anti-CD20 rituximab) have been usefully employed without significant side effects in HCV-positive RA patients. The antiviral therapy of IFNα plus ribavirin (RIBA) can also be employed after careful hepatologic evaluation of patients. Interestingly, anti-TNFα, rituximab, and cyclosporine A seem to have a potential synergistic effect if associated with antiviral treatment (IFNα + RIBA). Usually, HCV-associated arthritis is poorly aggressive and may respond to low doses of steroids and hydroxychloroquine (HCQ). The use of other disease-modifying anti-rheumatic drugs (DMARDs) presents the above-mentioned limitations, while rituximab may be usefully employed, especially in patients with more aggressive arthritis. Finally, rituximab may represent the first-choice treatment in patients with arthritis in the setting of MCs. Ab, antibody; CCP, cyclic citrullinated peptide; RF, rheumatoid factor. Patients who present with both HCV infection and arthritis can either have a simple comorbidity of RA and HCV infection or HCV-associated arthritis, with or without MCs. The first may be treated with standard strategies used for RA with some precautions in consideration of the concomitant viral infection and possible liver involvement. Some DMARDs, in particular methotrexate and leflunomide, may be employed after carefully evaluating and monitoring liver involvement, while biologics such as anti-TNFα and rituximab have been usefully employed without significant side effects in HCV-positive RA patients . Interestingly, these biologic therapies, as well as cyclosporine A, seem to have a potential synergistic effect with antiviral treatments for hepatitis C [16, 17]. Therefore, careful hepatologic evaluation of these patients is always mandatory, taking into account the opportunity for antiviral treatment . On the whole, patients with concomitant RA and HCV infection require the same clinical assessment and monitoring as patients with HCV-associated arthritis with or without MCs; they may have an increased risk to develop some HCV-associated complications, such as B-cell NHL, even as a consequence of immunomodulating therapies. Usually, HCV-associated arthritis is poorly aggressive and the patients may respond to low doses of steroids and hydroxychloroquine. The use of other DMARDs presents the above-mentioned limitations. On the contrary, rituximab may be usefully employed, mainly in patients with more aggressive disease, and may represent the first-choice treatment in patients with arthritis in the setting of MCs . Besides the HCV-related conditions described above, other rheumatic diseases have been suggested to be associated with HCV infection; namely, osteosclerosis, myalgia, fibromyalgia, poly/dermatomyositis, polyarteritis nodosa, Beçhet's syndrome, systemic lupus erythematosus, and antiphospholipid syndrome [1, 8, 9, 29]. Osteosclerosis is a very uncommon condition described in adults infected with HCV and can be defined as an acquired, painful skeletal disorder characterized by a marked increase of bone mass [37–40]. Clinically, osteosclerosis is characterized by nonspecific, often diffuse bony pain and tenderness over involved bones due to periosteal stretching, in the absence of joint swelling or motion limitation. Radiographic examination shows bony sclerosis and thickening of the long-bone cortices, mainly diaphyseal cortical bone. Laboratory investigations frequently reveal abnormally increased markers of bone formation (alkaline phosphatase, bone-specific alkaline phosphatase, and osteocalcin); these alterations were mirrored by the marked increase of bone mass (bone mineral density) and enhanced radionuclide uptake at scintigraphy (99mTc-MDP). Bone biopsy shows increased numbers and thickness of trabeculae with parallel reduction of bone marrow [37–40]. The pathogenesis of this rare syndrome is still unknown. It has been suggested that HCV alone or in combination with other unknown agent(s) may infect and alter bone cells or their precursors in predisposed subjects. These alterations might be mediated by the production of bone growth factors, such as insulin-like growth factors or osteoprotegerin. The pathogenetic role of this latter factor seems to be relevant as an imbalance in the osteoprotegerin/RANKL (receptor activator of nuclear factor kappa-B ligand) system leading to a pre dominance of osteoprotegerin has been documented . With regards to therapeutic approaches to osteosclerosis, attempts to treat with antiresorptive agents in at least seven patients was ineffective, while symptomatic treatments may provide some benefit. In some cases a partial or complete spontaneous remission of symptoms and/or bone sclerosis was observed during follow-up [37–40]. Anecdotally, in a recently published case report the antiviral therapy was followed by a recovery of skeletal sclerosis . Myalgia has been recorded in a significant number (15%) of patients from a large series of HCV-infected individuals . The pathogenesis of this symptom remains difficult to explain, although the detection of viral genomic sequences within muscle fibers suggested a direct involvement of HCV in the pathogenesis of diffuse muscle pain . Fibromyalgia has also been reported by some studies in a significant percentage of patients with chronic HCV infection , but other studies in series of patients with typical fibromyalgia have not confirmed this association [9, 43]. 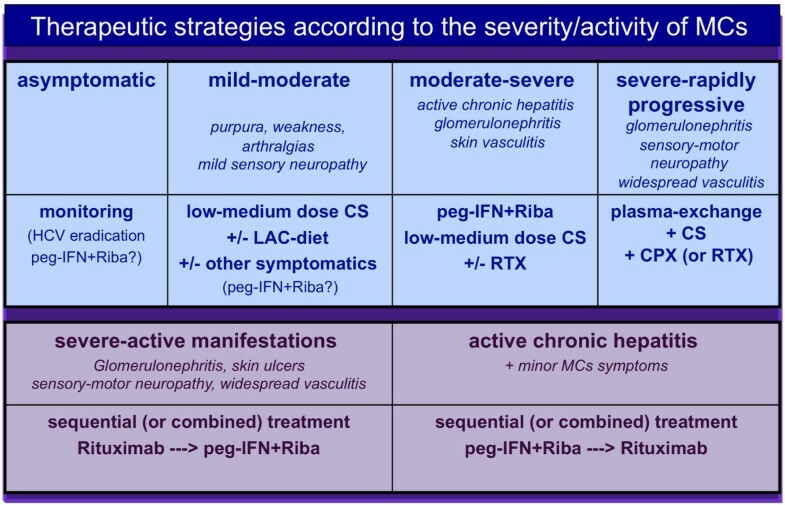 On the other hand, the differential diagnosis between fibromyalgia and muscle pain, frequently associated with weakness and arthralgias, may be very difficult in the setting of HCV-positive patients. With regard to sicca syndrome and pSS, some authors prefer to maintain HCV-associated myalgia and classical fibromyalgia as distinct entities [9, 43]. Several case reports in the literature have documented an association between poly-dermatomyositis and HCV infection [1, 8, 9, 29, 44]. Generally, these disorders appear in patients with long-lasting viral infection or may complicate IFNα treatment . Similarly, cases of vasculitis involving medium-sized arteries suggesting the diagnosis of polyarteritis nodosa have been associated with HCV infection [29, 46]. In addition, HCV seropositivity has been reported in a significant percentage of patients with polyarteritis nodosa . This possible association is not surprising considering the well-known relationship between polyarteritis nodosa and another hepatotropic virus, hepatitis B virus, which is responsible for a significant number of patients with this vasculitis . Polyarteritis nodosa may share numerous clinical symptoms with MCs; thus, patients with suspected HCV-associated polyarteritis nodosa should be correctly classified by means of wide clinico-serological and pathological work-up. With regard to other possible HCV-associated disorders, namely Beçhet's syndrome, systemic lupus erythematosus, and antiphospholipid syndrome, data reported in the literature are generally anecdotal [8, 9, 29, 48, 49]. Even if a possible causative role of HCV in these autoimmune diseases cannot be totally excluded, these patients might be better classified as having a simple comorbidity. However, they invariably represent a troublesome clinical condition, mainly with regards to therapeutic approach. As for HCV-associated MCs, patients with concomitant autoimmune systemic disorders, such as poly/ dermatomyositis, polyarteritis nodosa, systemic lupus erythematosus, and HCV infection may be usefully treated with immunesuppressors (for example, cyclophosphamide and rituximab) with some important pre cautions and limitations due to viral infection. In all instances, a preliminary clinical evaluation of liver condition and viral replication is necessary before any therapeutic decisions are made. These latter may be based on standard immunosuppressive treatments, possibly integrated by sequential/combined antiviral treatment. HCV-associated disorders include a spectrum of different immunological and neoplastic manifestations, among which are some rheumatic diseases. On the basis of clinico-epidemiological, histopathological, and molecular biology studies, the strength of association between HCV and a given disease varies largely among different diseases and, more interestingly, for each disease among patient series from different countries. Autoimmune systemic diseases often represent a clinical syndrome, which may include different clinicoserological subsets. These latter are the resulting phenotypes of multiple genetic, environmental, and infectious pathogenetic cofactors. MCs represents an important example of these multifactorial and clinically multifaceted disorders, potentially triggered by HCV infection in a variable percentage of cases. Considering the wide range of clinical phenotypes, some HCV-associated diseases may present important classificatory/diagnostic difficulties, and may constitute a real therapeutic dilemma because of the coexistence of autoimmune manifestations and viral infection.